It was time to clear up after the Easter celebrations. I went to collect my basket which I had loaned to the young people as part of their props. I missed my basket – I use it in the family area. When I got to the hall and looked for my basket, I realised there were still things inside. On peeking in, this is what I found. Aren’t they delightfully coloured? I wonder how they did the gold ones so beautifully. These young people can be so creative! It seemed a shame to unpack the lovely display to take my basket, so I walked off and left it. Oh, I didn’t leave empty handed though. I took something – a photo! 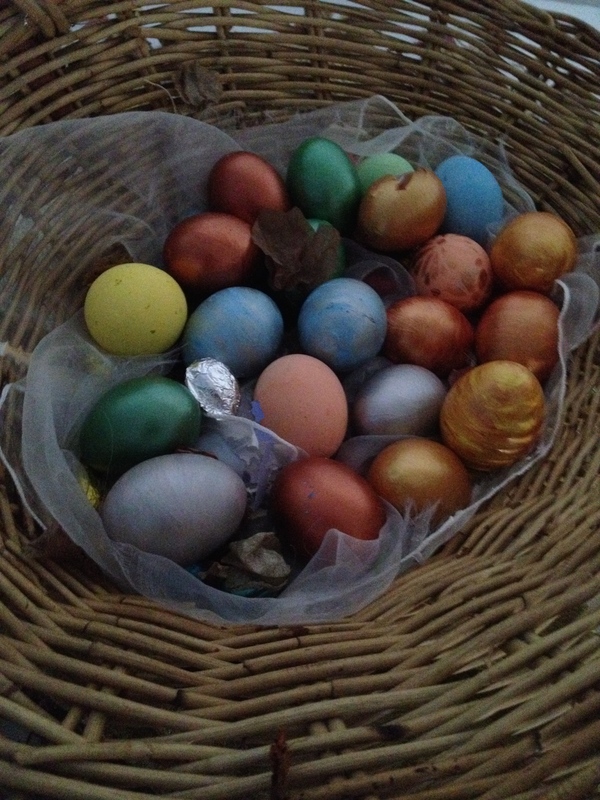 This entry was posted on 27/04/2014 at 22:19 and is filed under Craft, Easter. You can follow any responses to this entry through the RSS 2.0 feed. You can leave a response, or trackback from your own site.